The ZBrushCore Alpha palette contains a variety of grayscale images known as Alphas. These images look like nautical depth soundings used to map the ocean floor — nearer portions are lighter, more distant portions are darker. Used with sculpting brushes, Alphas determine the shape of the brush being used. You can add Alphas to this palette by importing images from disk files. Unlike standard 8-bit grayscale images which contain 256 gray levels, ZBrushCore Alphas should be16-bit images which contain over 65,000 gray levels. 8-bit images will load but the sculpting quality will not be as good. The Import button loads an image from a saved file. ZBrushCore recognizes a number of standard image formats for import including .bmp (Windows Bitmap), .psd (Photoshop), .jpg (JPEG). You can select multiple alpha images and load them all at once. If you import color images, they will automatically be converted to grayscale. 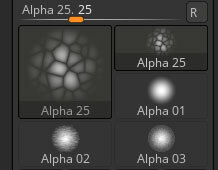 Alphas can be selected from either the Alpha palette, or the large Alpha thumbnail on the left of the ZBrushCore interface. In either case, click on the large thumbnail to bring up the full selection of alphas. Within the palette, you can also click one of the small thumbnails that show recently used alphas, to select it. 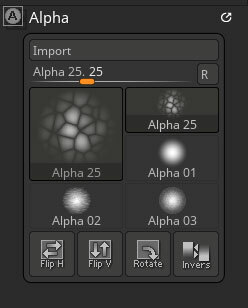 The inventory of alphas works the same as others in ZBrushCore, such as those in the Tool and Material palettes. The active alpha is grayed out to indicate that it is already selected.